The grass family, Poaceae, is one of the largest plant families, and, to humans, perhaps the most important, as it includes agricultural grains such as wheat, rice, maize (corn), and sugar cane. The Poaceae comprise about 600 genera and perhaps ten thousand species. It is estimated that grasslands cover about 20 percent of the earth's land area. While the Poaceae family comprises those species that are botanically regarded to be "true grasses," the term "grass" is also used for many plants that are not part of the Poaceae family but may be similar in appearance or have grass as part of their name. An overview of these other "grasses" is presented in the section on "grasses" outside the Poaceae family. Grains, which provided a preservable source of carbohydrates plus nutrients and some protein, were among the plants first domesticated by humans; the grains became key factors contributing to the human diet and also the economy, and hence to the development of civilization. Grasses, like orchids and palms are flowering plants (angiosperms) having only one cotyledon, or embryo leaf, and are called monocotyledons. Also included among the angiosperms are the Dicotyledons, have which two cotyledons or embryo leaves. Although the largest family in the Monocotyledon group (and in the flowering plants) is the orchids, the most economically important family in this group is the grasses, which include the true grains such as rice, wheat, maize, and rye. 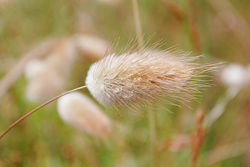 Unlike Dicotyledons, the true grasses are specialized for wind pollination and generally produce small flowers. Most grasses grow low to the ground, although a few, such as corn, sugar cane, and bamboo, are tall. Typically hollow stems (called culms), plugged at intervals (the nodes). Leaves differentiated into a lower sheath hugging the stem for a distance and a blade; a ligule (a membranous appendage or ring of hairs) lies at the junction between sheath and blade. Small, wind-pollinated flowers (called florets) sheathed inside two glumes (bracts), lacking petals, and grouped into spikelets, these arranged in a panicle, raceme, spike, or head. Fruit that is a caryopsis: The seed and fruit merged together to form a hard dry grain. Grass leaves grow from the base of the blade. This enables them to quickly grow back after being eaten by animals, or mowed by a lawn mower. Most grasses send out creeping stems, called stolons if they grow above the ground and rhizomes if they grow below the ground, from which new plants grow. Some grass species are annual, dying at the end of each growing season and leaving seed to grow a new generation the next season, while some are perennial, living for more than one or two years. Most grasses grow in places that are too dry for forests. Grasslands are areas dominated by grass. Among the natural types of grasslands are prairies, steppes, and savannas. Prairies are grasslands found in temperate climates with moderate rainfall, and they have taller grasses than other grasslands. Prairies are found in the American Midwest, eastern Argentina, Hungary, and northeastern China. Steppes are short grasslands found in dryer areas with cold winters. They are found in western North America, Russia, and central Asia. Savannas are grasslands with widely spaced trees. They are found in tropical, subtropical, or temperate areas with seasonal rainfall. They cover large areas of Africa, India, North and South America, and Australia. Pastures are grasslands where forest growth is hindered by human activity, not climate. Many animals depend on the leaves and grains of grasses for food. Grasslands support a rich community of living things, from large herbivores such as bison, kangaroos, and antelopes, down to insects and worms. Many other types of plants besides grasses also grow in grasslands including trees, shrubs, and annual wildflowers. Early humans hunted in grasslands and ate the grains of grasses. About 10,000 years ago, people in the Middle East started to plant wheat, barley, and other grasses and harvest the grains. Over many generations of cultivation, the plants gradually changed and became different from their wild ancestors. Many varieties became dependent on humans for survival because their seeds became more tightly attached and had to be beaten off by threshing rather than scattering naturally. The same thing was happening with rice in Asia and with corn in the New World. At the same time, animals were also being domesticated and soon sheep, goats, and cattle were grazing on wild grasslands and providing food for humans. Today, most human food comes from grasses, directly as grain or indirectly as feed for meat and dairy producing animals. A great part of the world's grasslands have now been converted to human use. In the United States and Canada, almost all of the old prairies are now corn and wheat fields. Cattle graze on much of the steppes and savannas. 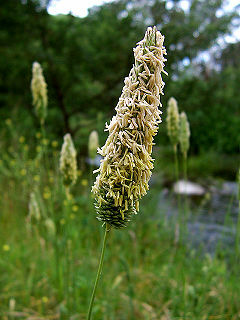 Besides food, grasses also provide humans with fuel and materials for construction and industry. They prevent erosion, decorate gardens, and provide a surface for parks and sports fields. The wheat genus, Triticum, comprises about 30 species. Two species of wild wheat, wild einkorn, T. boeoticum, and wild emmer, T. dicoccoides, still grow in the Middle East. Wheat is an annual, as are all other grasses grown for grain, since they produce more seeds than perennials. It grows about 0.6 to 1.5 meters (2 to 5 feet) tall. 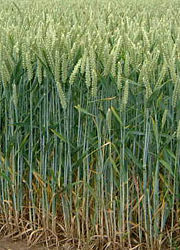 Wheat is grown primarily in areas that are too cold for other crops. China, India, the United States, and Russia are the biggest wheat growing countries. Wheat grains are ground up into flour, which is used to make bread, pasta, and other foods. Wheat straw is used to feed animals. Almost all the cultivated rice is Asian rice, Oryza sativa. There is also African rice, O. glaberrima, which was first domesticated in West Africa about 3,500 years ago. Rice grows in a warm, humid climate and needs lots of water. Rice fields, or paddies, are flooded and drained several times during the growing season. About 90 percent of the world's rice crop is grown in Asia where it makes up the largest part of most people's diets. Rice plants stand about 1.2 to 1.8 meters (4 to 6 feet) tall; however, newer varieties have been bred that are only around 0.9 meters (3 feet) tall in order to prevent them from falling over as the grain matures, which had been a major cause of crop loss. 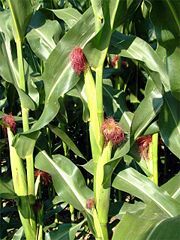 Corn, Zea mays, or maize as it is called in most places outside of the United States and Canada, was first domesticated about ten thousand years ago in Central America. It may be the result of hybridization of two or more wild species. Its cultivation spread throughout North and South America so that by the year 1000 it was grown from Chile and Argentina to southern Canada. Corn was introduced to the Old World by Columbus and within a hundred years it was a well-established crop in Europe, Africa, and Asia. Corn can grow as tall as 9 meters (23 feet), but most varieties are about 2.5 meters (9 feet) tall. In the United States and Canada, most corn is grown for food for cattle and other livestock. Worldwide, much corn is consumed directly by people as whole corn, corn meal, and as corn starch, corn oil, and corn syrup used as ingredients in other foods. Corn is also used to make alcohol and many industrial products. The United States is the largest corn grower, producing about two-fifths of the world's total crop, with China second. Sugar Cane, Saccharum officinarum (hybridized with other Saccharum species), was first cultivated in Southeast Asia and neighboring islands about eight thousand years ago. From there, it spread to India and then to China and to Europe and the New World. Unlike the grains, it is a perennial; the stems can be harvested each year for up to ten years. In early times, and still today in areas where it is grown, people chewed on the soft inner pulp of the stems to get the sweet juice. The process of extracting the juice and crystallizing it into sugar started in India at least 2,500 years ago; this is the main use of sugar cane today. It is also being grown to produce alcohol as a substitute for gasoline, especially in Brazil. Brazil, India, China, Cuba, Pakistan, and Mexico are the leading sugar cane growers. Rum is producing solely sugar cane products. The various species of bamboo, members of the subfamily Bambusoideae, are not cultivated but are very useful to humankind. Bamboo mostly grows in the tropics and subtropics, from the southeastern United States through most of South America, in Africa, and in southern and eastern Asia and northern Australia. Some species can grow as tall as 40 meters (130 feet), making them the tallest grass by far. From prehistoric times, people have used the woody stems of bamboo as a building material and to make many kinds of tools and other useful things. In recent years, it has gained popularity as a flooring material and even as a substitute for steel reinforcement bars in concrete construction. Sheep graze on green pasture lands at the edge of Giants Causeway in Northern Ireland. 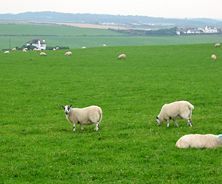 Lawns developed from pastureland used to graze sheep and other animals. The animals kept the grass clipped to an even level, which looked nice and provided a pleasant surface for strolling, resting, and sports. Toward the end of the Middle Ages, Europeans began to maintained lawns for their own sake rather than mainly to feed animals. In modern times, especially in the twentieth century in the United States, as more people owned homes and as cities and schools built parks and sports fields the amount of land area devoted to lawns increased tremendously. Christina Milesa, in a NASA sponsored study, estimated the area of the lawns of the United States to be about 128,000 square kilometers (almost 32 million acres). This is three times the area used to grow irrigated corn in the country. It is also estimated that 50 to 70 percent of U.S. residential water is used for landscaping, mostly to water lawns. Lawns are planted with various species of perennial grasses (Kentucky bluegrass, Poa pratensis, is one of the most commonly used) and sometimes with clover and other plants. Besides their appearance, they also have the benefit of cooling the air around homes, preventing erosion, filtering the air, and helping to absorb unwanted noise. An area of grass-like plants. Brown, L. 1979. Grasses: An Identification Guide (Peterson Nature Library). New York: Houghton Mifflin Company. Jenkins, V.S. 1994. The Lawn: A History of an American Obsession. Washington, DC: Smithsonian Institution Press. Milne, L., and M. Milne. 1967. Living Plants of the World. New York: Chanticleer Press. Went, F.W. 1963. The Plants. New York: Time-Life Books. Watson, L., and M.J. Dallwitz. 1992. The grass genera of the world. Retrieved August 20, 2008. This page was last modified on 25 August 2008, at 23:20.